Fusion rope effect rugs - If a relaxed and comfortable decor is sought after, then our Fusion range could just be the ticket. The woven rope effect construction sways towards a trend for informality, the neutral colours and natural yarns give a comfortable natural feel. 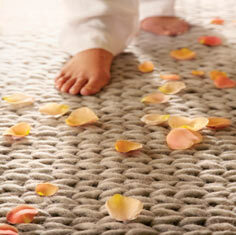 Fusion plain rugs use a mixture of New Zealand & European wools to create a handmade master piece, beautiful and elegant. Large over-sized, matching floor cushions compliment this collection. Bespoke sizes and colours are available to order, please contact us for prices and info.